If you want a more detailed synopsis/review of this movie, take a look at the one on Doughnut Gunso’s blog. Hayate, Nagi and company go on a trip to Ayumu’s home in the countryside to refresh themselves during the last few days of summer vacation, but Nagi’s high expectations are crushed when she discovers that she can’t buy Haagen Daaz’s, there’s no Starbucks and it’s incredibly hot with no air-conditioning nor cellphone signal anywhere within the vicinity (not to mention that Hayate made her leave her PSP and NDS at home… you evil butler, you!). Hayate catches a glimpse of a beautiful blue-haired woman in a kimono in the distance who mouths the words, “I will save you.” Since apparently, no one else saw this woman, he thinks nothing of it and goes on with his butler duties AKA being a full-time babysitter for his childish, demanding mistress… who is being more childish and demanding than usual because the countryside is simply boring and hot with no internet, anime or video games (I concur). Things take a turn for the worse when Hayate, Nagi, Kayura, and Hakuo’s baka-trio (Izumi, Miki and Risa) discover an amusement park in the middle of the woods at night and the park’s mascot suddenly decide to kidnap Nagi. 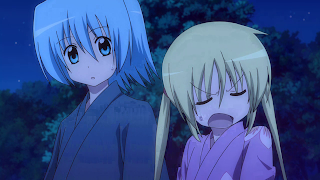 Naturally, Hayate tries to come to the rescue as usual but the blue-haired woman from earlier gets in-between them and suddenly everything goes black. 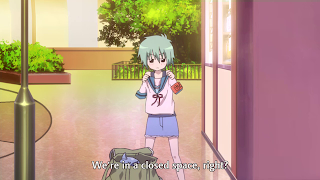 Hayate wakes up inside his room in Ayumu’s vacation home and immediately starts frantically searching for his ojou-sama, who is apparently nowhere to be found. Chiharu points out that she’s been there all along and finally, Hayate is relieved to come face to face with his mistress, a twin-tailed Maria in a sundress! Surprise! Apparently, Miss Blue Hair has replaced Hayate and everyone else’s memories of Nagi so that Maria now takes her place. 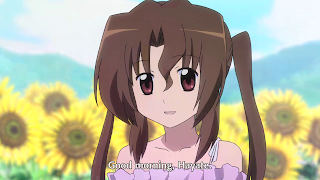 Hayate... I am your grandmother... no, really. Meanwhile it’s revealed that Nagi and her companions are still stuck in the amusement park. She discovers that they’re somehow trapped inside a closed space with no way out – and if you think this is a Haruhi reference, you would be correct. The screenshot tells the tale. If you don't get the reference, your otaku level is weak, child. While Nagi and company try to look for a way out of the amusement park, Hayate is busy “enjoying himself” with Maria Ojou-sama, Hinagiku, Ayumu and Chiharu who have all had their memories of Nagi and company replaced. Hayate feels that something is missing but can’t quite make out just what it is exactly – until he accidentally touches Hinagiku’s hand which sparks a recent memory of him touching someone else’s hand. 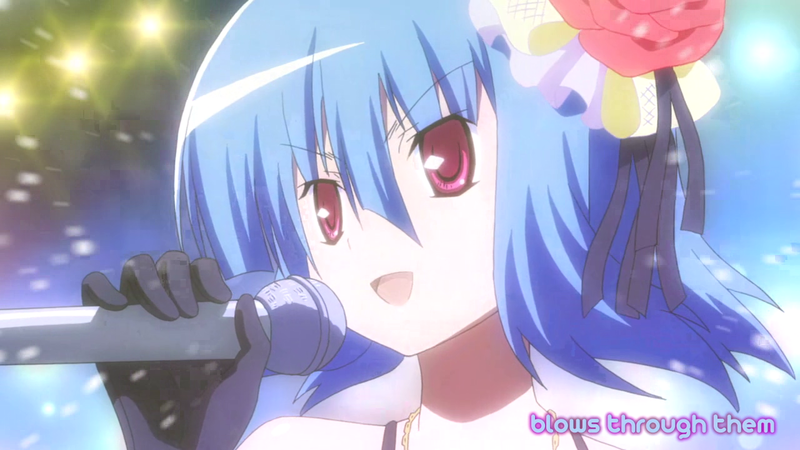 Miss Blue Hair shows up once more in front of Hayate to give him a 150 million yen diamond that would finally free him from his debt – which he reluctantly accepts. Meanwhile, Nagi and company decide that their only hope is to call for help and for several comedic reasons, Nagi is left alone inside the ferris wheel to attempt to call for help by finding a signal with her iPhone. Right on cue, Miss Blue Hair (who will never be named within this movie) shows herself to Nagi and apparently taunts her by saying that Hayate won’t come to rescue her because he has been freed from his debt and no longer has to be her butler. Of course, our fiery little twin-tailed tsundere refuses to believe this. 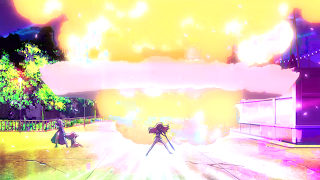 Blue Hair apparently thinks that perhaps there still may be a chance that Hayate will come to save Nagi, so she decides to make sure that doesn’t happen and powers up via purple aura charge. Sensing that her life might be in danger, Nagi uses her ultimate technique: screaming “Hayate!” at the top of her lungs. Apparently, it works and from possibly miles away, Hayate hears Nagi’s voice which also simultaneously cracks the closed space surrounding the amusement park (we learn later that Isumi and Sakuya coming to the rescue together with Hinagiku and her Shirosakura might have had something to do with this too) and memories of Nagi immediately come rushing back to his head and off our hero goes to save his mistress. The movie culminates with Hayate doing an awesome dive kick while jumping off a roller coaster right on the car that Nagi and miss Blue Hair were on. Hayate gives her back her diamond and tells Nagi that he’d rather pay his debt back on his own, to which she responds with, “yes, I’ll be waiting.” The Blue Haired Girl then apparently ascends into heaven having finally found peace and Hayate carries Nagi in his arms and jumps out of the ferris wheel carriage from hundreds of feet up in the air like a boss! 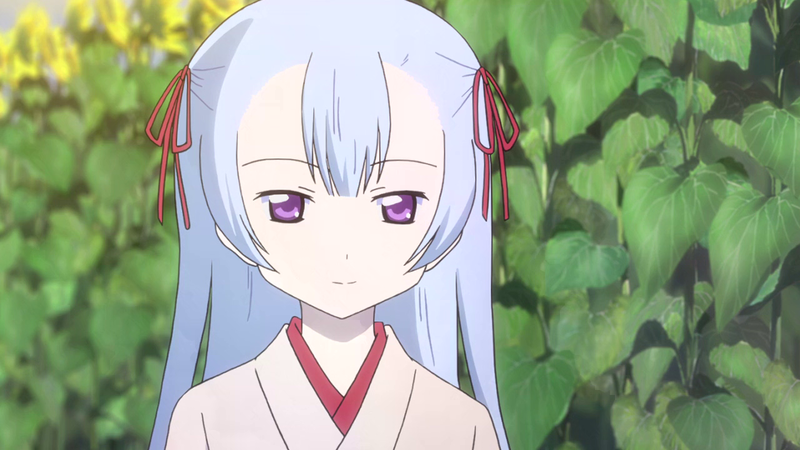 At this point, the movie is basically concluded and all that’s left is to imply that the Blue-Haired lady was actually the ghost of Hayate’s grandmother (her name is Suzune by the way, even if this is never mentioned in the movie) and that they had been to this very same amusement park together many years ago. Finally, the credits roll with Hayate and Nagi walking side by side and disappearing into the horizon as “Heaven is a Place On Earth” by FripSide starts playing in the background. The movie ends properly beyond the credits roll with a scene between Yukiji and Kaoru-sensei and one last moment with Nagi and Hayate that mirrors the scene at the start of this film. Hayate no Gotoku! Heaven is a Place on Earth is one of the most refreshing anime movies that I’ve seen in a long time. It contains just the right mix of comedy, coherent storytelling and just a hint of angst to make it an entertaining film to watch for just about anyone. HIAPOE is not and does not pretend to be a masterpiece. It’s based on a simple framework – the relationship between Nagi and Hayate. The movie works upon this simple framework and makes use of all its elements to make it shine. It’s apparent throughout the movie that HIAPOE is basically a Nagi and Hayate movie. The supporting characters are definitely a lot of fun and their interactions and dialogue help to keep the film from becoming too serious, but it is painfully obvious that everyone is there simply to help the two main characters shine – and fortunately, our butler and mistress combo do not disappoint when it’s their time to take the stage. In this movie in particular, we get to learn about several facets of Nagi’s personality that anime-only watchers don’t see quite too often. First of all, everyone is aware that Nagi is rather bratty and spoiled and she definitely acts that way at the start of this anime. However, she is generally nice in her interactions with others – especially if it’s Hayate, and can also be quite dependable. She knows how to play up to her strengths when the situation arises and this is shown when she is the only one who knows how to take charge of things and to at least try and find a way out of the closed space when the rest of her companions are dead set on fooling around in the amusement park. She also shows surprising insight when she has that conversation with Hayate’s grandmother. And of course, everyone knows that she’s a hikkikomori otaku and is proud of it! – which is often played up for comedic effect in this movie. accordingly if you plan to watch it. 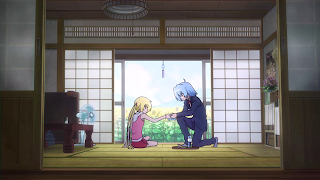 In Hayate’s case, the film serves to highlight one important fact that Hayate has already made clear in the manga: Nagi Sanzen’in is the most important person in his life – or, to be more precise, the person he wants to protect the most. Whatever his reasons might be, they are not made fully clear in this movie. He certainly has a debt of gratitude towards her for that “Masked The Money” stunt as well as breaking the King’s Jewel/forfeiting her inheritance (read the manga in chapter 252) for him, but is that really all there is to it? The author, Kenjiro Hata, has definitely implied something more than that in the new anime seasons (and this movie) that the manga’s timeline hasn’t caught up to just yet, but he’s also done a good job of dancing around the issue and keeping everyone guessing. Again, this movie doesn’t do anything that hasn’t been done before, but it certainly does things right. The hand wiping scene was brilliant, in my opinion, precisely because of this. 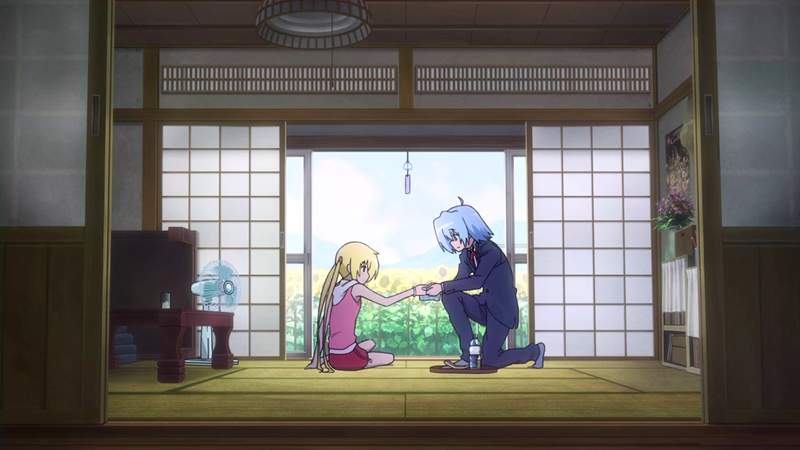 Near the start of the movie, Nagi gets her hands all sticky from throwing a watermelon rind at a Cicada for apparently “bullying her” and Hayate takes a piece cloth and carefully partially wets it from a water bottle and takes Nagi’s hand and wipes it. The way this seemingly insignificant scene is used in the movie is brilliant – regardless of the fact that there might have been countless other movies/stories that have done this before. As FripSide’s song goes, this memory is “etched” into Hayate’s mind and later becomes instrumental in reminding him of the ojou-sama that he’d almost forgotten. It was great to see that this scene is then given closure at the end of the movie when Nagi gets her hands all sticky again from eating a candied apple and Hayate offers to wipe them – pretty much mirroring the hand wiping scene near the start of the film. While rabid Hina fans might feel a bit disappointed that Hinagiku didn’t get a bigger role in HIAPOE, she does at least get her 5-15 seconds in the spotlight when she pulls out the Shirosakura and saves Kayura and Miki from some rampaging robots that went out of control when the amusement park’s “reality marble” collapsed. Hina shows us her Zanpakutou's released form: "Scatter, Shirosakura!" Although you probably wouldn’t know much about Ruka (long story short: she’s an idol who is in love with Hayate and she’s also a bit of an otaku) unless you read the manga (or the wiki), she is actually one of my favorite characters in the series next to Nagi. Unfortunately, I’m beginning to find her a bit annoying recently since she’s been uber clingy ever since she started falling for Hayate. This movie happens in a future timeline that seems to be destined to become canonical to the manga, so it is at least assurance that Ruka’s original cute, sarcastic personality will eventually return and that she remains in good terms with Hayate and his ever-expanding inadvertent harem after the current natsucomi arc. Read the wiki… okay, fine. Basically, Kayura Tsurugino is Nagi’s friend who is the same age as her and who likes to cosplay. Her parents are in the manga industry and she supports Nagi’s dream of becoming a mangaka who will sell a trillion copies of her own manga. Aside from this, not that much is really known about her. That would be Chiharu Harukaze, you might recognize her as Sakuya’s maid/the student council vice president if you’ve seen the 2nd season of the anime. What you probably don’t know is that she’s also a closet otaku who also likes anime, manga and video games, which explains why she and Nagi are pretty friendly with each other in this movie. She is generally the voice of reason in the Violet Mansion where Nagi, Maria and Hayate are currently living in with Chiharu, Hinagiku, Kayura, Alice (Athena Tennousu in little girl form for some unknown reason) and Ayumu as its tenants. Maria should wear those twin-tails even if she’s in her maid uniform. Maybe then people will actually believe that she’s just a fresh, young 17 year-old. If nothing else, I’d be as bold as to say that the movie is worth watching just to hear the awesome vocal songs that it employs. Of course, my favorite would be the movie’s namesake, Heaven Is A Place On Earth by FripSide – if that’s not obvious enough from the music video I made and am using in this review. Hayate no Gotoku! Heaven Is A Place On Earth is a definite must-watch if you have even the slightest interest in the series. It takes the classic butler comedy formula that has worked so well for the anime/manga and translates it well into the big screen. Over-all, it’s a solid movie with great characters, memorable scenes, amazing vocal songs and no particular weaknesses as long as you know what to expect and don’t ask for too much from a one-hour anime film.